THE white sandy beach, crystal clear water and picturesque scene made me fall in love with Redang island. I was touched by the glory of nature on the island, surrounded by the coconut trees. It was an unforgettable trip. 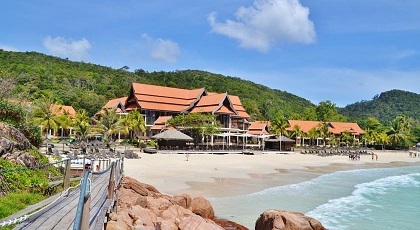 We stayed at Redang Beach Resort, did all the standard activities and mingled with other guests. At night, we enjoyed the barbecue, walked along the beach and sat on the rock enjoying the night scene. Snorkelling was most enjoyable. Since it was our first experience, there was initial fear which was overcome by curiosity. It was totally delightful to see corals, sea cucumber and colourful fish like reef shark, blue spotted stingray and clown fish. The best was when the fish bit my finger and swam all around me. It was wonderful. This was my first trip to the island and definitely won't be the last! Redang is just like the Perhentian a MarinePark. It's located 45 km off the coast of KualaTerengganu is the largest of the group of islands dotting the South China Sea off the Terengganu coast. The island offers crystal clear waters and numerous dive sites for the enthusiast. Sheltered within the Pulau Redang Marine Park, the waters here abound with marine life. Redang Archipelago exists of 9 islands. The Pulau Redang archipelago comprises Pulau Redang, Pulau Lima, Pulau Paku Besar, Pulau Paku Kecil, Pulau Kerengga Kecil, Pulau Kerengga Besar, Pulau Ekor Tebu, Pulau Ling and Pulau Pinang. Around the Islands the sea is full of marvellous marine fishes, turtles and coral reefs that ensure great snorkelling and scuba-diving. Pulau Redang is the biggest of all the islands in the Marine Park, measuring about 7 km long and 6 km wide. The boat trip starts from the fishing village of Merang. This is a fishing village North of Kuala Terengganu. You can get there by bus. The boat trip takes about 40 minutes. Most of the boats depart for Redang and return before noon. Each resort has its own boat transfer schedule. This may change and is dependent on the tide, sea and weather conditions. The best time to visit Redang is between April and October. Take note that most resorts are closed during the North-east Monsoon, which blows from November to March. 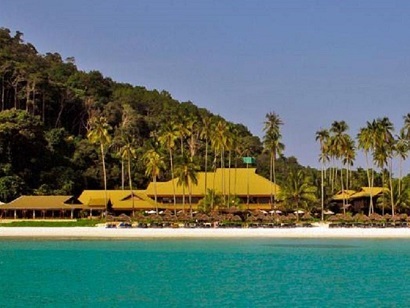 Redang Island is perfect for snorkelling, swimming, scuba diving, jungle trekking, boating and canoeing. This paradise-like island offers crystal clear water, pearly white shores, a colourful array of spectacular marine life, a breathtaking sunset and what could be the world's most mature coral gardens. This is your chance to see and be acquainted with the local eel, giant garoupa, black tipped shark, etc. Chance encounter with the Green turtle and Hawkbill turtle is common. There are corals of every imaginable shape, size or colour. The observant are rewarded with sights of flatworm, nudibranch, shrimp, squid, cuttlefish, stonefish, lionfish and pipefish. 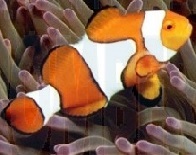 Collecting and taking of aquatic life ( corals, shell or fishes whether living or alive ). Fishing without a license & Causing Pollution (3.2 km radius), i.e. littering Possession of spear fishing equipment. The waters around Pulau Redang also contain two historic shipwrecks. The H.M.S Prince of Wales and the H.M.S Repulse were sunk here at the start of World War II, setting the stage for the Japanese occupation of Malaya. The hilly island of Redang can be fascinating in its own way. There is a moderately well trodden and marked path between Pasir Panjang and Teluk Dalam beach, about 2 km long. Sights include a small stream and pools alive with catfish, the occasional encounter with the shy kancil (little deer) and monkeys, and other jungle flora and fauna. At the end of the trek is the Berjaya Redang Beach Resort at Teluk Dalam. For the more adventurous, there are rocky cliffs and outcrops away from this beaten path that offer spectacular overhead views of Pasir Panjang below. This fishing village "Kampung Air" on wooden stilts is located jus across the Marine Park Centre at the mouth of the Redang river. Kampung Air, which in English means 'Water Village', was built in 1976 by the Terengganu State Government and is now home to about 1200 residents, mostly comprising fishermen and their families who are believed to be descendants of one of seven Bugis siblings from Celebes, Indonesia. The village school has about 200 students, most of whom prefer to work at the resorts on Redang Island rather than continue with the fishing tradition of their forefathers. Incidentally, these local fishermen are the only ones allowed to fish within the protected waters of Redang Marine Park as they have been doing before the park regulations were enforced. If you're visiting, try Mak Teh Yam's goreng pisang (banana fritters) at the Wakil Pos. The people that lives on Pulau Redang are descendents of Bugis settlers who came from Celebes, Indonesia long time ago. It is said that seven of the Bugis siblings batins (Batin means holy men) from Celebes travelled here to look for new places to settle down. One of them called Batin Talib decided to make Pulau Redang his new home. Till today, only two of Batin Talib's colleagues can be traced. 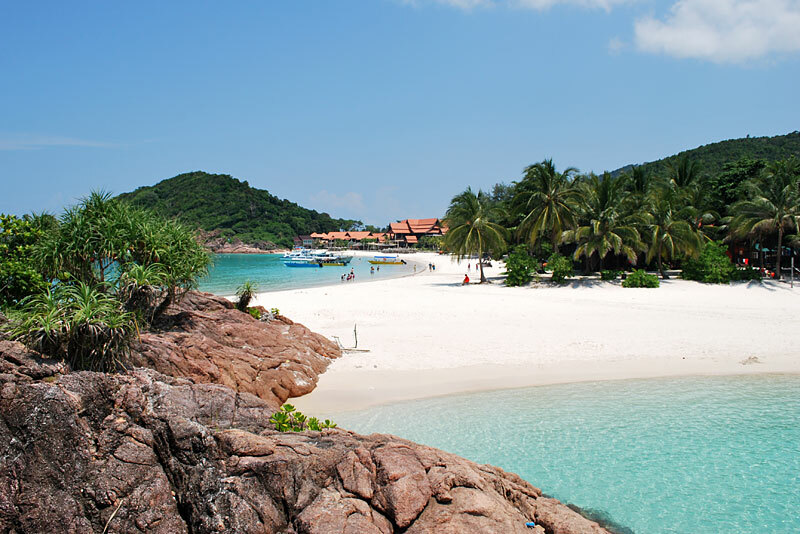 Batin Mina is said to settled down in Pulau Perhentian, in the north. Batin Mina's sister, Batin Cik Siti settled up river on the mainland (Ulu Terengganu). Where the other four Batins went were not known. The early settlers Batin Talib and the first settlers established their first village at Teluk Kalong, an area facing a lagoon on the east side of the island. He and his villagers then moved to a smaller island down south where they found better shelter from the prevailing wind. This small island is covered with betel nut palms (pinang). They named this island Pulau Pinang. In the seventies there are approximately 100 families living on Pulau Pinang. As the population grow, the villagers decided to move to the river mouth at Kuala Sungei Redang. Till today there are only two inhabited islands in the Redang Archipelago. Pulau Pinang which houses the marine park centre and Pulau Redang which is the homeland to approximately 250 families. The local people on this island primarily earned their living by traditional fishing. Now most of these fishermen's are entering the tourism industry which is growing rapidly on the island. All settlers around the whole island are moved to a new village approximately 4 kilometres inland. This tropical island resort, located 45-kilometers off the coast of Terengganu, is close to 30 popular dive spots. 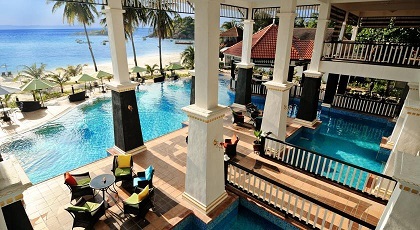 Guests will enjoy a tropical ambience that is unique to Redang Island. The location offers guests unprecedented access to a myriad of amazing natural recreation areas, including one of the most beautiful coral reefs in the world, ideal for sport divers. Within a close proximity of the hotel are the dive sites of Big Mount, Pulau Paku Kecil, and Boulder Dash. The hotel also features a vast selection of on-site dining choices that offer a compilation of international and authentic local dishes in a romantic ambience. The Taaras Beach & Spa Resort is the perfect property for travelers who want sensuous tropical atmosphere, a vast selection of on-site facilities, and a myriad of recreational areas near by. Situated along the shores, Laguna Redang Island Resort offers comfortable accommodation with free WiFi access in the public areas. Operating a 24-hour front desk, it features a restaurant and a large outdoor pool. Fitted with wooden flooring, air-conditioned rooms include a wardrobe, personal safe, a TV, fridge and seating area. The en suite bathroom comes equipped with shower facility, towels and free toiletries. At Laguna Redang Island Resort, guests can indulge in a pampering massage or enjoy activities such as hiking, diving and snorkelling. Luggage storage facility and airport shuttle services are also available. The in-house restaurant serves a delectable spread of local and Continental dishes. After-meal drinks can be enjoyed at the bar, while barbecue facilities are provided. 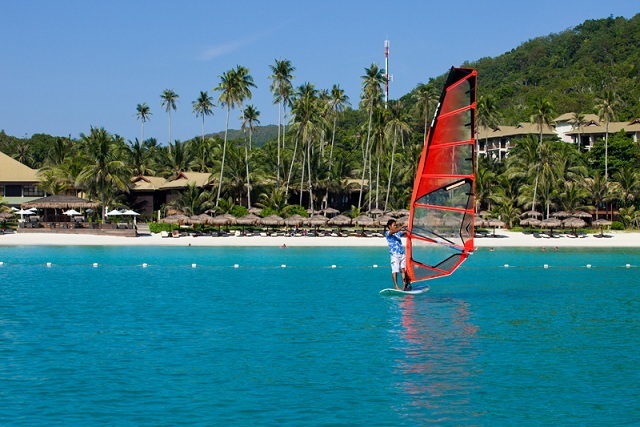 Laguna Redang Island Resort is about 15 minutes away from Marine Park by boat. 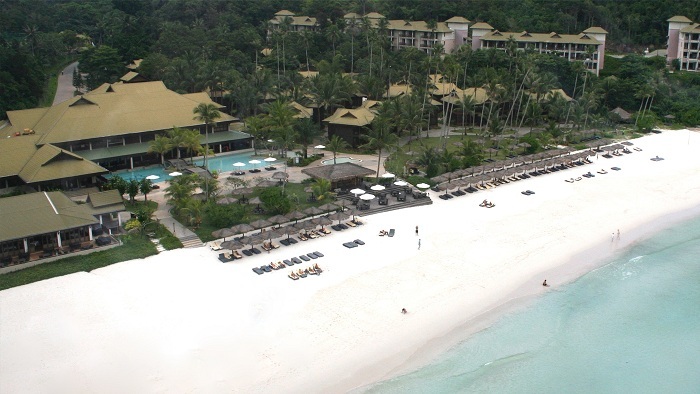 Steps from Pasir Panjang�s white sands and clear waters, Sari Pacifica Resort & Spa Redang offers spacious villas with private balconies and spa baths. It features a beachfront pool and restaurant. The spaciousness of tropical-style villas at Sari Pacifica Redang allows for a large walk-in closet and seating area. In-room comforts include a TV and hot shower. Lounge on outdoor day beds with a cocktail in hand or enjoy the views while swimming in the outdoor pool. Sari Pacifica also provides barbecue facilities, as well as snorkelling and diving equipment. Redang Sari Pacifica�s restaurant offers all-day dining with local dishes. Several dining options are easily accessible from the resort. Sari Pacifica Resort & Spa is about a 30-minute boat ride from Merang Jetty.